When 007 is sent to New Orleans to investigate the deaths of British agents (yes this seems to happen a lot doesn’t it). Mr. Big a man who is producing heroin comes to his attention and this leads to some rather difficult situations. This is the first outing as Bond for Roger Moore and the first time I have ever watched him as 007. This was a pretty good start I must admit, they still gave him so brilliant lines and he could deliver them in such a manner that Connery would have been proud. I think it made for a good change to get to my fourth actor as Bond. Even though Craig is after I have obviously seen the more recent films. While I don’t find Moore as attractive as Connery I do think he still has so much of the charm that is needed to be Bond. The story in this film is better than the previous instalments and kept me engaged throughout. 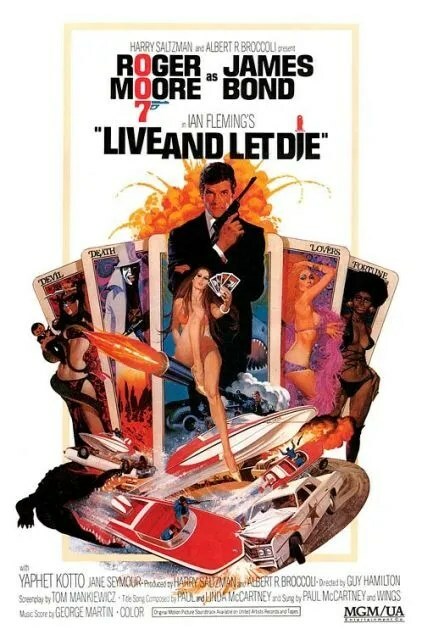 Not forgetting that the fact they constantly use Live and Let Die not only with the lyrics, but the music as well certainly did add more to the film in my opinion. I do like the song a lot anyway and has to be one of the best Bond themes (yes maybe that will be a post as part of the Bondathon). Even having it sung on stage as well was a nice touch. Mind you if the song was not fantastic I am sure I would then be complaining about how much it was used. I thought Mr Big was a very good bad guy and created some very good moments with Bond, he was very evil and it worked well. Especially a whole face ripping off moment which really did have me quite shocked! But what a line from Bond “Quite revealing” that really made me except Moore a lot more. Great moment and I was certainly shocked! The film does have quite a lot going on from a snake to crocodiles and the reading of tarot cards. Obviously with the latter Bond has them working in his favour, which was a rather amusing moment. So I feel more positive after watching this film and hoping that the next six films with Moore leading them are decent enough? Oh yes I know some people reading this are going to totally burst my bubble right? It is a long journey but I am certainly going to enjoy it a lot! While Roger Moore isn’t my favorite Bond I still love this movie. I’m pleased after the last couple to have enjoyed one more! This one is a classic! The boat chase is like no other chase in Bond. Plus the theme song is so memorable! I’m not a fan of this one. Well, I still like it but it’s my least favourite Moore Bond film. It’s my favourite theme song but I just really struggle to get into the film.